Yince upon a ferm steyed a sonsie reid hen, A deuk in a dub and a goose in a pen, A hairy grumphie, a yowe like a rug, A big strang cuddy and a jimp wee dug, Twa cats that miaowed and purred aw day, A braw prize coo and a clockleddy tae. Now available in Scots for the very first time, What the Ladybird Heard is the latest addition to Itchy Coo's fantastic range of books for children, now translated as Whit the Clockleddy Heard. In this new book, meet two crafty robbers, a tiny ladybird and a whole farmyard of fun. Hefty Hugh and Lanky Len have a cunning plan to steal the farmer's fine prize cow. But they reckon without the tiniest, quietest creature of all. And she has a plan of her own. 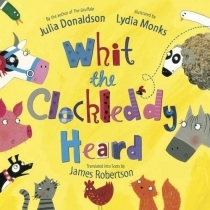 Join the ladybird as she has a new adventure in Scots that Itchy Coo readers will love.